We left Penicuik on Monday morning after enjoying a lovely Wimbledon party with the family on Sunday and sleeping on the street outside Adrian and Rachel’s house – in the van of course. We’re getting braver about wild camping since joining the Wild Camping forum and discovering all the interesting places they recommend for overnight stops. First stop on this trip was in the Ae Forest just north of Dumfries. The route took us along a single track road with virtually no passing places, onto an unmade track and finally into the forest carpark. 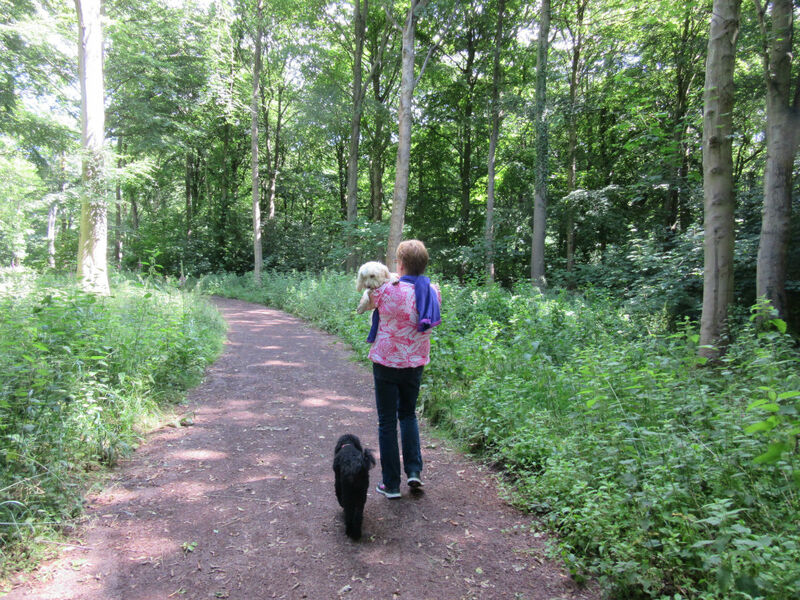 We were jiggled and shoogled and a bit frazzled by the time we got there so were mightily relieved when we found a lovely level spot and set off to walk the dogs along the forest paths. Poppy and Boo gave it their usual paws up, ‘this is the best place ever’ vote but we were less convinced. There was really nothing wrong with the place, our reservation came when we looked at the time and realised it was only 2.30 p.m. Far too early to stop for the night and, apart from the walks, there was nothing else to do. Off we went again, jiggling along the track and holding our breaths along the single track road and finally onto the road to Dumfries where our wild camping map told us that we could park right in the centre. We were frankly doubtful that this could be true but we set the sat nav and made our way through the town centre and into the Dock Park car park where we found ourselves in a row of motorhomes on the banks of the river. The dogs enjoyed the walk along the river bank but not as much as the forest. Fortunately their communication skills don’t stretch to making comparisons and putting in complaints to the management and they forgot all about the forest when they got some chicken with their tea. Leaving them to sleep off the day’s excitement we set off into town to find a Wetherspoons pub where we could eat out for not a lot of money and without having to change into anything smart or respectable. In other words we went out to eat in our joggers. How times have changed! The Monday special came with your choice of drink and we both chose soda water and lime. Old friends of Shirley take note and weep. Back at the van we made mugs of coffee and settled down for the evening, only to be surprised by a knock on the van door. What a good job we hadn’t put our PJs on – we do that sometimes at 7 p.m. Our visitor was a fellow Funster i.e. a member of the Motorhome Fun forum who lives in Dumfries and, cycling past, had seen our Fun sticker in the window. We chatted for ages with Alan, a really lovely man who gave us loads of tips for things to see and do in the area. He even let me have a go on his electric bike in the carpark. This turned out to be more scary than I anticipated as I shot off round the circle of cars at what felt like breakneck speed. Those things can really go! After Alan had left we reflected on the fact that sometimes unexpected kindnesses are a real blessing. We try to spread a little kindness where we can and very often we receive far more back and in unexpected ways. Alan, if you ever read this, you made our day! The next morning we returned to the town centre. I needed a pair of needles and Mr Google informed me that there was a knitting shop in the centre. Off we trotted, following directions to the shop near the High Street and found that it was closed until 10 a.m. It was 9.45 so we went into Mrs Green’s Tea Lounge to pass a little time and share a completely unnecessary scone with our coffee. If you are ever in Dumfries you must visit this wee café. It has the most lovely, warm, welcoming atmosphere and the fluffiest scones ever. We sat in a pair of scruffy old armchairs and drank excellent coffee and munched our way through our shared scone, chatting happily in a light hearted kind of way about what a lovely warm feeling the place had. After a bit I got up to use the loo (note: experienced motorhomers always pee in other people’s loos where possible to save the cassette filling up too quickly. Sorry if that’s too much information) – when I got back I found Shirley talking to a pleasant lady from the next table. It turns out she thought we were sisters and was apologising for her mistake, quite unnecessarily as far as we are concerned. I would only be upset if someone mistook us for mother and daughter. Anyway, the reason she had engaged Shirley in conversation was that she wanted to say that she’d noticed what a lovely energy there was between us. How lovely is that? We went on our way warmed and happy. All this goes to show that taking the time to speak to strangers can make their day, which is why, this evening, when we saw a single lady motorhomer parking up near us we went outside to chat to her. She thanked us, as we separated to go back to our vans, saying that travelling alone she sometimes doesn’t speak to another living soul for days on end. Single motorhomers beware – we are on the case! Next requirement – a public loo to empty the cassette and a tap to fill up the water tanks. The public toilet in Dalbeattie was the ideal place to deposit followed by a water tap in the Galloway Forest thoughtfully provided to rinse mountain bikes. I hope it was fresh water because we’ve got 80 litres of it on board as we speak. Following the coastal route through beautiful countryside the sat nav took us to a possible overnight stop by Kirkcudbright Bay. The spot in question had wonderful views out along the bay. It was also on a single track, dead end road with no suitable place to turn a 7.4 metre van. We discovered this after we decided it wasn’t suitable for us to stay the night, due to the lack of pavement or beach to walk the dogs. If your van is small and you don’t mind sitting inside it for several hours without going for a walk it could be a good place – otherwise not. After a 17 point turn on the mercifully quiet road we headed for Kirkcudbright where the Wild Camping map told us we could park near the harbour. We arrived there at about 4 p.m. and discovered at least thirty other vans there and no obvious place to park. After a bit of manoeuvring we settled for a spot by the fishing boats. It was distinctly smelly so we took a walk along the river bank in the hopes of finding a quieter and more fragrant spot. Giving up on that we walked back into town where we were met by a different and altogether more appealing smell – the Polarbites fish and chip shop was open for business and filling the air with temptation. We didn’t resist. Two freshly caught and cooked fish suppers were hoovered up on the dock side where the town had thoughtfully placed a picnic table. Life really doesn’t get much better than this. Early evening we were off again in search of a quiet spot for the night. Gatehouse of Fleet came up with the goods with a huge carpark beside the river and a lovely woodland walk. We drank our after dinner coffee on yet another council provided picnic bench before settling down for the night. Someone remind me why we need a house? Another great read ! And I agree with the lady in the coffee shop you both have a lovely energy !! Great to catch up. I will pass on your eatery recommendations in Dumfries to my Kathryn who has moved to work there as a Podiatrist! Sitting in our caravan in Grantown on Spey as I type ?. Happy days.